What is the Hydro Twist™? The Hydro Twist™ Pipe Cleaning System from Hydroblast has been designed for the fast and safe cleaning of pipes up to 3000mm in diameter. Working at pressures of up to 1200 bar, this high-pressure water tool will navigate bends to remove all kinds of deposits including blockages, corrosion, scale, concrete and debris. 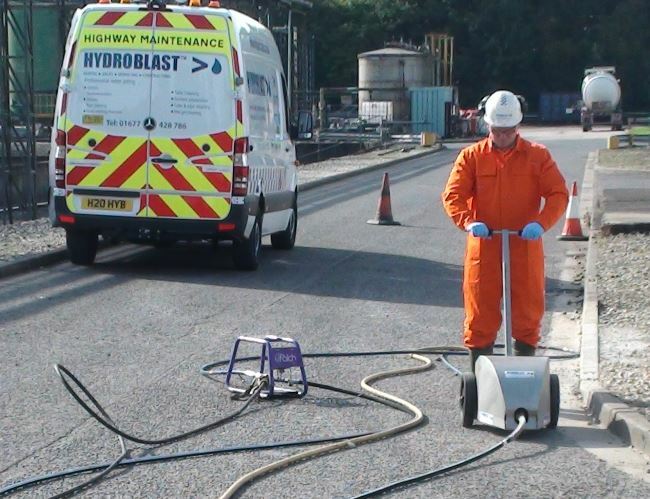 As the newest tool in Hydroblast’s range of pipe cleaning equipment, the Hydro Twist™ combines all of our knowledge and expertise. This has resulted in a practical, effective piece of equipment which has been designed with the safety of its operatives in mind. How Does the Hydro Twist™ Work? The Hydro Twist™ unblocks and cleans pipes using its water jetting twisting hose and its static jet-powered nozzle. Before entering the pipe, the hose is run through a Feeder Unit which is responsible for automatically guiding the hose into or out of the pipe. Rotated with an air-powered swivel, a section of flexible, stainless steel hose will supply the water at high pressures. Attached to the end is a fixed nozzle that has been specifically designed for even distribution of the blast. Featuring adjustable wheels and positioned on the front of the pipe, a feeder unit will feed and pull the hose automatically through the pipe. This movement is synchronised with the forward motion of the nozzle, offering a consistent clean of the entire tube. Why Use the Hydro Twist™? The Hydro Twist™ cleaning tool can be applied to a number of commercial and industrial applications, including but not limited to; oil and gas exploration, civil engineering, petrochemical and oil refining, food, drink and chemical manufacturing, utilities and power generation. Its ability to handle hazardous environments adds to this versatility. The combination of the jet-powered nozzle and high-pressure hose enables the Hydro Twist™ to achieve a consistent clean for pipes of all shapes and sizes. It is able to remove a wide variety of incrustations, including latex, concrete, wax and bitumen. Similar to our other high-pressure robots, the Hydro Twist™ can be operated remotely from a safe distance. This means that the operative will not be required to touch the machine during the water jetting, keeping them safe in the unlikely event of a burst hose or cracked nozzle. The Hydro Twist™ is able to clean up to 600 meters of pipe in one shot from a singular access point. This saves a great deal of time and money as the operative isn’t requires to split open the pipe to carry out the cleaning process. The system’s flexible hose has been designed to suit pipes of various lengths, diameters and configurations, all from one access point. This allows it to accomplish consistent, thorough results in even the most complex and bended pipeline constructions. Whether you’re cleaning sensitive plastic or strong graphite pipes, the advanced settings of the Hydro Twist™ will prevent it from causing internal damage to the pipes, even when working at high pressure. The Hydro Twist™ has been designed with operatives in mind, with an advanced, practical operating system to cater for simple programming. The operative will simply adjust the rotation and forward speed to suit the task at hand. Whilst programming the Hydro Twist™, the operative needs to take note of the pipe diameter and length, any deposits inside the pipe and the number of bends that the device will have to navigate. To achieve the best results, a combination of fast rotation speed and low feed should be used. If you have a complex pipe cleaning project and would like to find out whether the Hydro Twist™ would be suitable, contact us today and member of our knowledgeable staff will be happy to help. Alternatively, visit our Pipe Cleaning page to learn more about our water jetting services.